Despite its imperfections, however, this remains an important photograph, as it allows for what I will call the "digital reincarnation" of this otherwise forgotten private's life. Fortunately, a previous owner had written some important information on its back. 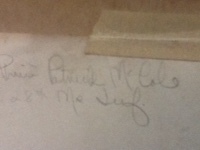 It says "Private Patrick McCole 28th Ms. Infantry." I researched this name and unit, assuming "Ms" meant Mississippi, and starting, of course, at the National Park Service's Soldiers and Sailors page. I did not find that name in that unit, and, in fact, found no history or list of soldiers for that regiment, which momentarily confused me. I then searched by name only and found his name in the 28th Massachusetts Infantry. This made sense, as the picture does show a soldier wearing blue. I should have noted that first, but I believe I read the writing on the picture correctly and suspect the writer simply was confused over the abbreviation of one of the endless number of "M" states. Once I confirmed the unit, I found out this was a more fascinating picture than I had expected, due both to this soldier's personal story and the history of the regiment he had joined. I hope I can do this soldier and his story justice. This soldier was Private Patrick McCole. He had been born in Ireland in approximately 1824 or 1825 according to census records (though I found it easier to locate him on those records by finding his wife's name. I could not pull up his name on census records on ancestry.com, but there it mysteriously was, starting in 1850, once I found his wife, Margery or Mary.) Like many Irish immigrants, he was Catholic. He found employment as a cordwainer (shoemaker) in Lynn, Massachusetts and on October 1, 1861, he joined Company A of the 28th Massachusetts in Boston for a term of three years. The 28th Massachusetts was organized in Boston in the fall of 1861. After recruiting volunteers in the area, it mustered into service on December 13, though Patrick did not muster in until December 31 at Camp Cameron, according to records from the National Archives and in his children's pension files on fold3.com. Most of the regiment's men were Irish and very proud of this fact, so they adopted the nickname the "Faugh-aballagh" regiment. This was an Irish war cry for "clear the way." 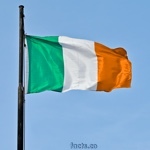 Their formal name at the time was the "Second Irish Regiment of Massachusetts Volunteers" and they expected to be part of an all-Irish brigade, though that did not happen until later, much to their frustration. In early 1862, the regiment travelled to New York for more training, then headed to South Carolina. Patrick's company and a few others spent time on sometimes difficult detached duty. Once back together, the entire regiment soon "saw the elephant," including fighting at the Battle of Secessionville. In July, the regiment moved north to Virginia and became part of the U.S. Army's 9th Corps, commanded by Ambrose Burnside. On September 1...the 28th Massachusetts was again ordered into the fight. Against enormous odds, the Irishmen joined the Cameron Highlanders of the 79th New York in a desperate charge across a cornfield. ...concealed rebel brigades fired shattering volleys from the woods ahead. The Irish and Scots staggered, wavered, and then let go a cheer as Gen. Isaac Stevens rode to the front and urged them forward just as the skies opened up with a blinding thunderstorm. Private Patrick McCole was among the 99 men who perished that day. Exactly when, how and how quickly he died is unknown. If his was not an instant death, how much or how long did he suffer? Did the storm make his suffering worse? Killed. Co. A- Patrick Callahan, shot through head; Timothy Kent, Patrick McCole, James Phillips, shot through heart. How and when did Patrick's friends and family find out this terrible news? Another question is about his burial. Was his family able to retrieve his body and take it home? One researcher thinks it is possible, though not certain. I have not found any more definitive information on this question, though the unit's history site does not include his name on a list of known burials. 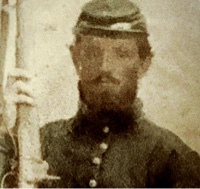 It seems likely he was buried on the battlefield, perhaps in an unmarked grave. 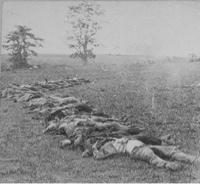 Bodies ready for burial at Antietam, courtesy nps.gov. Could Patrick's body have been in a similar scene at Chantilly? During the remainder of 1862, army life continued to be challenging for the survivors of the 28th. They fought in another bloody battle at Antietam and then, a few weeks later, finally became part of not only an all-Irish brigade, but of THE Irish Brigade before ending the year suffering through the tragedy at Fredericksburg. Over the final years of the war, the 28th Massachusetts remained part of the Irish Brigade, even as it underwent changes, and continued to fight in some of the biggest battles and campaigns in the war, including Chancellorsville, Gettysburg and the Overland Campaign. Please see the regimental history site, http://www.28thmass.org/ for a more detailed account of its service. Patrick McCole, like so many others, had immigrated to the United States and, like so many others, fought to defend his new government. At some time during his service, perhaps while still near Boston, he found the time and money to have his portrait taken. Was it to be a gift for his children or other family at home? Was he proud of his service and wanted a keepsake? Did he just want to try something new? This may have been the only time he experienced this fascinating and still-young technology. No matter its purpose, this photograph has somehow survived the many years and decades since then, with his name remarkably and fortunately recorded on it, allowing for the viewing of Patrick's bearded face and the sharing of his fairly short and sad life story. Having his portrait taken when he did was fortunate timing for Patrick (and for us), as his life would not last much longer, ending at just 37 or 38 years of age. He left behind two orphans, son Charles, age 13, and daughter Mary Ellen, just 2 years old. Their mother, his wife Margery, had died on January 25, 1862, due to childbed fever one day after giving birth to a still-born child, while Patrick was away from home. This portrait may have been all that Mary Ellen remembered of her parents. Patrick likely had many other friends who mourned him as well, including his colleagues in the 28th Massachusetts. The government awarded Patrick's children a pension of $8 monthly, effective the date of their father's death. It was payable to their guardian, until they reached age 16, when payments terminated per a law Congress had passed on July 14, 1862. Mary Ellen received a $2 monthly increase in 1866 but Charles was not eligible for an increase since he was already 17 by that time. Here is a brief 1890s description of the purposes of that law. The rebellion had been in progress more than a year, and the end was not yet in sight. Troops were needed, and it had become evident that if citizens were to be induced to voluntarily leave their homes and expose themselves to the perils of active service, more liberal provision must be made for the families to which they might never return. It was accordingly enacted that if any officer or enlisted man had died since March 4, 1861, or should thereafter die, by reason of any wound received or disease contracted while in the service of the United States and in the line of duty, his widow should receive the total pension of his rank, to continue during life or until re-marriage; and if no widow survived, or in case of her remarriage, a like pension was granted to his minor children. An interesting part of the pension records is that there were questions about Patrick and Margaret's marriage. Several documents in the file discuss this question, including one from a city office that could find no records of their marriage. One form lists confirmation of their marriage on a list of evidence received for this pension request. This confirmation was a letter from a Catholic priest named Patrick Strain who verified that Reverend Charles Smith had married the couple August 26, 1848 as well as testimony from the marriage's witnesses. This issue likely was just an effort to verify the children's identities beyond all doubt by fully confirming who their parents were. Some of these records mention the children's guardian, Celia Deary, and mistakenly state that Patrick had died at the "Battle of Bull Run, Va." (They do note the correct September 1, 1862 date.) An affidavit from the guardian states Patrick was a volunteer in the "war of 1861" (a phrase which was also pre-printed on another form) and includes the statement "she has not in any manner (illegible, possibly scratched out) engaged in, aided or abetted the rebellion in the United States." Records on ancestry.com seem to suggest that Celia (or Cecilia) may have been Margery McCole's sister. Celia's maiden name was Giliway per her death certificate, though a list of marriages list it as McGilaway. Various forms on ancestry and fold3 listed Margery's as McGilaway or McGalloway or McGillaway. Other records, however, including a list of Massachusetts deaths, give her name as "Gallagher," and even list her parents' names. I do not see a marriage for her before the one to Patrick, so the question of her background and why Celia became the orphans' guardian remains uncertain for now. A 1923 letter from U.S. Representative William Connery Jr. of Massachussetts states that Charles felt that the government still owed him money due to his father's death at "Chantilla," but the pension office replied that both of Patrick's children had been eligible for pensions until age 16 and that those pensions had been paid out to their guardian, with nothing further due. 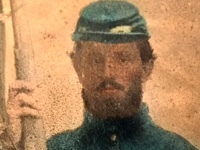 Thus ends the story of this soldier's brief life and military career, even as the portrait he purchased allows his life story to live on more than 150 years later. Rest in peace, Private Patrick McCole.